Baby bird identification can be a challenge as young birds grow, often changing feather lengths, colors, and markings in just a few days. Many birders have been both confused and excited by finding a young bird they didn’t initially recognize, hoping it is a new species to add to their life list. If you understand how baby birds look and behave, however, you won't be fooled. Once you know what you’re looking at, you’ll enjoy watching these amusing young birds go through their early life cycle. How Old Are Birds We See? Typically, young birds visiting feeders or hopping on the ground are fledglings, birds that have grown enough of their adult plumage to begin flying but that are not yet fully mature. These birds may be anywhere from 2-5 weeks old depending on the species and how much they have developed. They demonstrate many youthful characteristics, including both physical and behavioral traits that can help you identify them successfully. These youngsters are not usually fully independent, however, and will still receive some care from their parents. The first step in determining what species of young bird you see is to be sure it is, in fact, a juvenile bird. Some adult birds look similar to fledglings, but these characteristics can help you be certain that you are seeing juvenile birds. Bill Size: Juvenile birds often have bills that seem proportionally too large for their head. This is because their heads have not fully grown and their feathers are not yet covering the edges of the bill, making it seem larger. Feather Length: Young birds have not grown full flight feathers, and the feathers on their wings and tail will be noticeably stubbier than on adult birds. The feathers on their breast, flanks, and abdomen may also seem fluffier and less organized than those of adult birds, not only because they're not fully grown, but also because young birds do not preen as effectively as adults. Some feathers may be so underdeveloped that the birds even show bare skin, especially on the face. Color: Many juvenile birds have drab, dull plumage similar to that of an adult female. As they molt, their feathers may have additional speckles, buff edges, or other disorganized colors that help camouflage them until they can fly skillfully. Eye Size: Very young fledglings and nestlings have bulging eyes that seem too big for their head. This should not be strongly noticeable in birds that are ready to leave the nest, but if the birds were displaced very early their eye size can indicate their youth. Behavior: Young birds often try to draw the attention of their parents. They may beg for food or flutter their wings, especially when near adults. They may also be uncertain in flight or may visit feeders but seem unsure of how to eat what is offered. It should be noted, however, that many juvenile behaviors, including fluttering and begging, are similar to the courtship of adult birds. Behavior alone is not a sure indication of whether or not a bird is juvenile, but it can be a valuable clue. If a bird exhibits several of these characteristics, it is likely a young bird. The next step for most birders, then, is to determine just what species of bird it is. Identifying a baby bird is difficult, and to determine a young bird’s species, birders must watch for these three key characteristics. Geography: It is easy to jump to conclusions about young birds being rare species. One of the first things to consider is the geography of where the bird is located and whether or not that is a nesting or breeding area of a common regional bird. Before declaring a juvenile bird as a member of a rare species, be sure it is not related to birds commonly found nearby. Plumage: While young birds will not have their adult plumage, coloration, and markings, they should show some similarity to adult birds, particularly on the wings and tail. As the bird matures, those markings and colors will become more distinct. Many juveniles also resemble adult females quite remarkably but will be smaller in size. Community: One of the easiest ways to identify a baby bird is to see what adult birds it stays near. Young birds often follow their parents and beg for food or imitate their behavior, and if one mystery baby is consistently around a certain species, it is most likely the same type of bird. Brood parasites can be dramatic exceptions, however, but their differences are often so profound it is easy to tell they're actually "foster" birds of a different species. Many times it may be impossible to identify a juvenile bird, particularly if it is younger than most fledglings. If this is the case, instead of feeling disappointed, simply observe the bird for several days and enjoy watching it grow and mature. Eventually, identification will become easier. 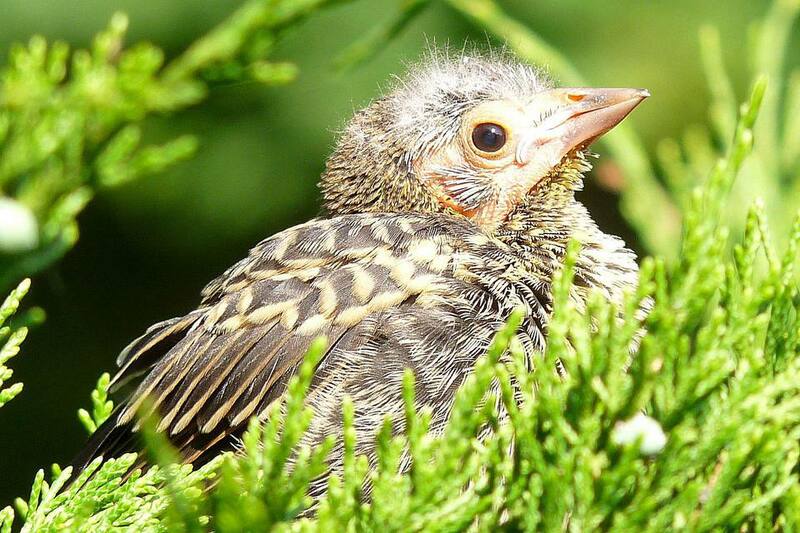 Compassionate birders may want to assist young birds, particularly if the bird seems unable to fly or acts in distress, and it is important to know what to do if you find a baby bird. Young birds often leave the nest a few days before they can successfully fly, but the parent birds are usually nearby and watchful, even if you can’t spot any adults. Watch the bird for several hours to see if the parents tend to it or if it is able to care for itself. Too much nearby activity or unfamiliar visitors can cause baby birds considerable distress, elevating their heart rate and creating disorientation. Too many observers may also scare adult birds away, preventing them from checking on their offspring. Return it to the nest. If the bird is obviously too young to have left the nest, with no flight feathers or unable to move, replace it in the nest carefully. Birds will not abandon a baby that has been handled by humans (most birds have a very poor sense of smell), and returning it to the nest will ensure the parents know where it is. If you are unable to return it to the nest, place it nearby in a sheltered, safe area. If the bird is injured or if parents do not return to tend to it, contact a local wildlife rehabilitator, Audubon chapter, or other wildlife or birding group. State and federal laws prohibit unlicensed individuals from keeping or caring for wild birds, even if they intend to release them into the wild. It can be rewarding and enjoyable to observe juvenile birds, watching them grow and mature at your feeders. By knowing what to look for and how to identify baby birds, you won’t miss a minute of their youth.